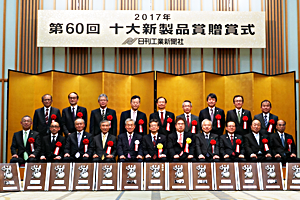 The Mazak UD-400/5X has won the Main Prize as “One of the Best 10 Products in Japan in 2017” awards, held by the Nikkan Kogyo Shimbun Ltd., one of the leading industrial newspapers in Japan. 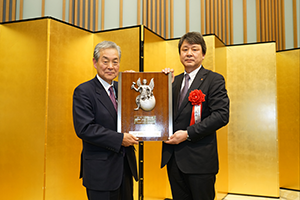 The “One of the Best 10 Products in Japan” awards are presented by the Nikkan Kogyo Shimbun Ltd. to products that contribute to the advancement of industrial development and strengthening Japan’s international competitiveness, chosen from products developed and introduced each year by participating companies. 72 products were submitted by 68 companies for the most recent competition, which was the 60th in its history. The UD-400/5X is a high accuracy 5-axis machining center designed for high speed micro- precision machining. The high speed 45000 rpm spindle provides higher productivity and double column construction ensures high accuracy over extended periods of operation.